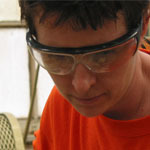 Since 2003, she has worked collaboratively with Suzie Silver on a range of projects including objects, installations, videos and performances (www.harpsilver.com). Drawn to exotica, science fiction and pre-digital special effects, they create d.i.y. spectacles by combining technical sophistication with humble materials. They have exhibited their objects and installations throughout the U.S. including the Munson Proctor Williams Art Institute, Penn State University, and the Pittsburgh Center for the Arts, the Arizona State University Museum, Bucheon Gallery, San Francisco; and the Pittsburgh Glass Center. Their videos, have screened all over the world, including the 2004 Stuttgarter Filmwinter, Stuttgart, Germany; ENTERmultimediale 2, Prague, Czech Republic; Biennale Internazionale di Ferrara, Ferrara, Italy; Angle: The First International Short Film and Video Festival, Xiamen, China; and Arcipelago, 13th International Festival of Short Films and New Images, Rome, Italy. Their video, “Nebula,” is distributed by the Video Data Bank. They have performed their live media variety show “Fruit Machine” in a number of venues nationally including Transformer Gallery, Washington DC; Around the Coyote Festival, Chicago, IL; and the Pittsburgh Center for the Arts.